This study aims to identify and quantify the extent of current variation in service provision of a genetic testing service for dominant and X-linked retinal dystrophies in the English National Health Service (NHS). National audit data (all test requests and results (n = 1839) issued between 2003 and 2011) and survey of English regional genetic testing services were used. Age- and gender-adjusted standardised testing rates were calculated using indirect standardisation, and survey responses were transcribed verbatim and data collated and summarised. The cumulative incidence rate of testing in England was 4.5 per 100,000 population for males and 2.6 per 100,000 population for females. The standardised testing rate (STR) varied widely between regions of England, being particularly low in the North-east (STR 0.485), with half as many tests as expected based on the size and demographic distribution of the population and high in the South-east (STR 1.355), with 36 % more tests than expected. Substantial and significantly different rates of testing were found between regional populations. 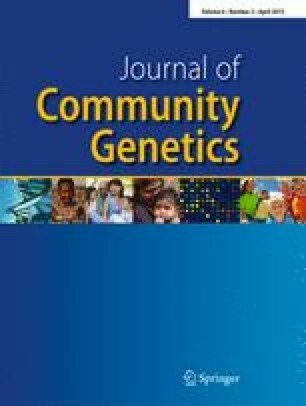 Specific policy mechanisms to promote, monitor and evaluate the regional distribution of access to genetic and genomic testing are required. However, commissioners will require information on the scope and role of genetic services and the population at risk of the conditions for which patients are tested. The online version of this article (doi: 10.1007/s12687-014-0210-4) contains supplementary material, which is available to authorized users. This work was supported by RP Fighting Blindness (UK) (Project Grant No. GR570), Fight For Sight (Programme Grant No. 1801), the Manchester NIHR Biomedical Research Centre (BRC), Moorfields Eye Hospital Biomedical Research Centre and the Greater Manchester Comprehensive Local Research Network. This is a clinical audit and service evaluation not requiring ethical approval. This article does not contain any studies with human or animal subjects performed by the any of the authors. Mark Harrison, Stephen Birch, Martin Eden, Simon Ramsden, Tracey Farragher, Katherine Payne, Georgina Hall, and Graeme Black declare that they have no conflict of interest.